Do you want to track your classes, trials, earnings, and credit score? This payment tracker is perfect for checking that your payment is correct, and can also be great for tax time! 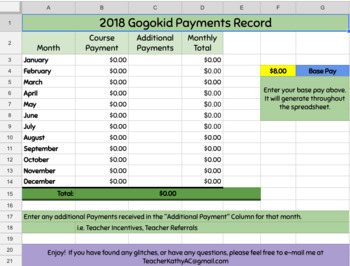 Simply copy and paste your completed classes into the Google Sheets and record your credit score to keep your payment tracker accurate! You only need to enter your base pay once on the Cover sheet! Your monthly and total earnings will always appear on the cover page, and your total monthly earnings will be displayed at the top. All versions of the payment tracker are current as of the new October Contract. This file is purely for Google Sheets. The Payment Trackers will not work for Microsoft Excel if downloaded--the formulas work differently. I am currently working on a separate version that works for Excel.